Sometimes I’m amused by my feeble attempts to wrap my mind around the ways of God when I cannot understand all of the features of this phone. It’s very likely that the settings aren’t set correctly. 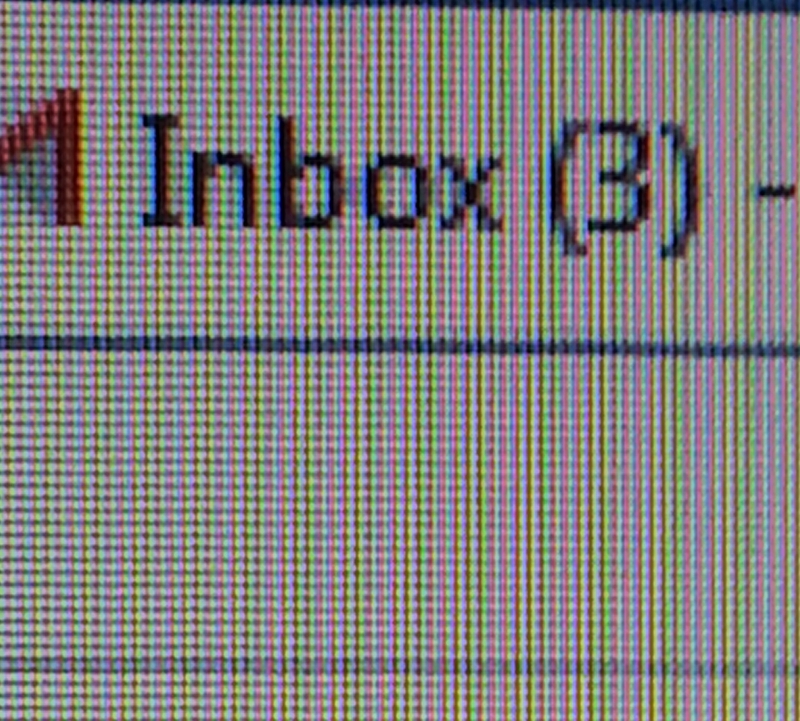 I had 3 new email notifications, but none of them were showing up in my inbox. So I refreshed and refreshed and refreshed again. No new messages. Now something like this drives me crazy. I mean, I need to know immediately what those 3 messages are. What if I am missing something life-changing? I tell you, the Holy Spirit is sharp (duh) and does not miss an opportunity. Because while I was fretting about my unread email, He whispered to my spirit that I had rushed away from home, leaving fresh messages from His Word unread . God had messages for me yesterday. Life-changing messages. Words that could refresh, renew, and transform me if I would take time to open and read. When I am fearful, He speaks words of protection (Isaiah 41:10). When I am weary, He wants me to know that I can come to Him (Matthew 11: 28 – 30). When I am weak, He assures me that His strength is made perfect in weakness (2 Corinthians 12: 9-10). When I lack purpose and vision, He promises to continue in the plans He has for my life (Philippians 1:6). When I am grieving, He reminds me that there will be a Day when tears will cease (Revelation 21:3-4). When I am frustrated, He asks me to wait for His good way (Psalm 27:13-14). When I doubt myself, He encourages me that He fashioned me just as He wanted (Psalm 139:13-14). When I need wisdom, His supply is available for the asking (James 1:5). When I want to lash out, He sets Jesus before me as the example of humility (Philippians 2: 1-11). When I don’t have what it takes, He offers grace that’s free (Ephesians 2:8-9). When I mourn for life as it used to be, He renews my hope in what life can become (Isaiah 43:19). When I lack the trendiest things, He exchanges my worldly desires for eternal ones (Matthew 6:19-21;31-33). Oh, that my heart, mind, and soul would be constantly accessible to the Words of the Spirit. God wired us for connection. When my phone alerts me to a new message, I enjoy the thought that someone wants to communicate with me. I’m disappointed when it turns out to be some lame, impersonal notice like my library book is overdue. But God is eager to communicate with me. And you. Every day. Every moment. His Word is living, active, relevant, and always personal. Oh, Daddy, I can barely believe that a year later, here we are, doing life without you. How I long just to sit in your presence. I didn’t know then. How desperately I need to be in a Father’s presence and say nothing and say everything. And the Founder of the universe allows me to come to Him as child comes to a Father. What extraordinary mercy! What an incomprehensible gift! He has messages that my heart needs to hear. How can I leave them unread? Today, I have a choice. I can rehearse my problems or I can refresh myself in Jesus’ presence. My problems tell me that life is stressful. Jesus’ presence tells me that He is sufficient. Which message will I choose to receive? As I walked from the hallway into my cycle class, I checked my phone again. 3 new messages in my inbox! All it took was a change in my position (and yeah, the messages weren’t all that important). Sometimes my soul requires a change in position. When my heart and my mind and my willfulness are rushing ahead, I must pause and make a u-turn. And wait. And admit my needfulness. When I open God’s Word and allow it to permeate my soul, the Holy Spirit can send the notification that the message is there – whatever the need is and whenever it arises. Humility helps me to hear. Dependence draws me to His Word. Obedience opens my eyes to His vision. May we pause and position ourselves so that the Holy Spirit will refresh us to receive them. Psalm 119: 35 – 37. This entry was posted in Eternity in Our Hearts, Fighting for Joy, Keep a Quiet Heart, Thoughts on faith and tagged Faith, God's wisdom, God's Word, Perspective, Seeking God, Trusting God on April 8, 2014 by Renee Ratcliffe. I noticed in Walmart on Tuesday, before the snowstorm that has paralyzed the South arrived, that just as many (well, almost as many) people were hunting the greeting card aisle as the bread aisle. Because no one, especially a Southerner, wants to be unprepared when the first flakes fall and the forecaster predicts that this is going to be a BIG one, right before the BIG day. Yet I imagine, especially if we’re still stuck indoors today, that there will be many homes in which the cards, roses, jewelry, and chocolate don’t arrive by Valentine’s Day. And, you know, that’s okay … Makes me wonder why we buy in (literally) to the idea that love has to be expressed in these particular ways on one particular day anyway? Last night, while the clinking of sleet against the window kept me awake, my thoughts wandered to things like love and Valentine’s Day, and how marriage to the man sleeping next to me has been a more unexpected journey than I could have ever imagined. This April, it will be twenty years since the day we stood before God and spoke words from the second chapter of Philippians to each other. And while it’s been a struggle sometimes, our vows to God and to one another are still intact even as the initial dreams that we had for our marriage are not. So, I would advise any starry-eyed couple who is nearly married to have second thoughts. I know, without a doubt, that my husband did. Like on the days into the second year of marriage when he had to pick me up off of the floor because my legs (and my soul) were too weakened to stand. Who could blame a young man for having second thoughts when his wife is buried under failure, depression, and shame? My husband committed himself to the promises that he made, based upon the second chapter of Philippians. And he purposed in his heart that his personal ambitions, needs, and desires would be second. And twenty years later, he and I know that enduring marriages are based upon second thoughts. Our union is not perfect now. We still live in the consequences of that most painful time, but we don’t regret it – not for a single second. Because we had to learn early that not every day is Valentine’s Day. Yes, there are moments of romance, but the days of roses are limited. Real love is expressed in the ordinariness of taking out the trash, getting the kids in the bath, clearing the toilet, and paying the bills. And the truest love – agape love – finds and expresses itself in the laying down of one’s very life, as Jesus did. Yes, it means (in the human experience) that there is morning breath, dirty laundry, harsh words, misunderstanding, and disappointment. But (in the eternal experience) there is a picture of Christ’s devotion for His Church – His unconditional love for His people who are utterly unlovable. “A Christian’s rule of life should be, My life for yours. He is concerned about the comfort and happiness of others, not of himself. He does not seek to have his own needs met, his own image enhanced, but to love God, to make Him loved, and to lay down his life to that end. In small ways as well as great, he shows the love of the Lord.” (Keep A Quiet Heart, page 162). If God’s plan for my daughter includes marriage, I ask Him to bring this kind of man into her life – the kind of man who has second thoughts. A man whose commitment to her is second only to his steadfastness to the Father. A man whose aspirations and wishes come in second place to whatever gives glory to God in his relationship with his wife and children. And lest I advise my daughter that second place is for the husbands, I remember that honor and respect is my calling as a wife. Placing myself second may require the setting aside of my pride and my preferences, but to follow God’s intention for my marriage is to lose nothing in the eternal realm. I must believe Jesus when He tells me that those who lose their lives for His sake will find them back again, fuller and richer and better than anything they could have expected. When a wife puts herself second in her marriage, she finds the grit and grace to do so for Jesus’ sake. And the immeasurable gift that she receives in return is way better than perishable roses and chocolate could ever be. Marriage is not for us. It is for God’s glory, designed in His mind to be the picture of sacrifice and selflessness. Husbands and wives who give Jesus first place in their marriages live in a way such that romance comes second to redemption. There are occasional opportunities for husbands and wives to be flush with romantic feelings. But there are daily opportunities for our marriages to reflect God’s redemptive love for us through continual giving of forgiveness and grace. Let us have second thoughts about marriage and follow hard after the example of the One who loves us first. “Let Christ himself be your example as to what your attitude should be. For he, who had always been God by nature, did not cling to his prerogatives as God’s equal, but stripped himself of all privilege by consenting to be a slave by nature and being born as mortal man. And, having become man, he humbled himself by living a life of utter obedience, even to the extent of dying, and the death he died was the death of a common criminal. That is why God has now lifted him so high, and has given him the name beyond all names, so that at the name of Jesus every knee shall bow, whether in Heaven or earth or under the earth. And that is why, in the end, every tongue shall confess that Jesus Christ is the Lord, to the glory of God the Father” (Philippians 2: 5 -11, J.B. Phillips New Testament). This entry was posted in Eternity in Our Hearts, Family, Fighting for Joy, Following Christ, Keep a Quiet Heart and tagged marriage, Valentine's Day on February 13, 2014 by Renee Ratcliffe. Psalm 23, the beloved Shepherd Psalm, is perhaps the best-known chapter of the Bible. Several months ago, at Easter in fact, I read a blog post that drew my attention to Psalm 23 in a new way by placing it in the context of the psalms that surround it. In “Living in the Valley – For Now,” Jonathan Parnell writes that Psalm 22, 23, and 24, when we look at them together, say something even more meaningful about Jesus’ devotion and authority as our Shepherd. “My God, My God, why have You forsaken me?” (22:1; see Matthew 27:46). “… scorned by everyone, despised by the people. All who see me mock me; they hurl insults, shaking their heads” (22: 6 – 7; see Matthew 27:39). “… people stare and gloat over me. They divide my clothes among them and cast lots for my garment” (22: 17 – 18; see Matthew 27:35). He is the King of glory (24: 8 – 10). But between Friday and Sunday, there is sorrow, uncertainty, disappointment, and confusion. There is a valley. There is a shadow of death. But it is a mere shadow. As Charles Spurgeon said, “Nobody is afraid of a shadow, for a shadow cannot stop a man’s pathway even for a moment.” Sunday’s a-coming. The Light of the World will dispel every shadow of darkness and death. The King of glory is coming. I wholly lean on the triumphant hope of Psalm 24. But today …. Today has felt like a valley. On days like these my head knows that Sunday is real but my heart is stuck in Friday. There is sorrow, uncertainty, disappointment, and confusion. I pray for vision yet I am short-sighted. There are steep and rugged mountains in the way. In Psalm 22, I remember Jesus as Savior. In Psalm 24, I trust Him as Sovereign. But today I find myself in Psalm 23. And I need a Shepherd. Between the images of Jesus’ cross and His crown, here is my Comforter. The Messiah is in the middle. He makes me to lie down in green pastures; He leads me beside the still waters. He restores my soul. I fit the characteristics of a sheep – stubborn, needy, timid, and prone to wander (Isaiah 53:6). Yet, as I see in Psalm 22, the Good Shepherd bought me with a very high price. Jesus said, “I am the Good Shepherd who lays down His life for the sheep” (John 10:11). Because this Shepherd is willing to care for me, a sheep, at such a tremendous cost to Himself, I can trust Him. Because this Lover of my soul is a Shepherd King – a King of glory – I can rest in His ability and authority to command all circumstances and lead me into places for my good – even the valley. Though I walk through the valley … You are with me. As a real-life shepherd, Phillip Keller explains that sheep are led to the mountain tops through the valleys because it is the well-watered route. In the valley there are rivers, streams, and still waters. The Shepherd who called Himself the Living Water (John 7:38) will refresh me again and again. Hope quenches my thirsty soul. And as I’m here in the valley, I remember that the Shepherd is leading me through it. This is not a stopping place. One day I will join Him in Psalm 24. “I am the gate for the sheep,” Jesus said, “Whoever enters through me will be saved. They will come in and go out, and find pasture … I have come that they may have life and have it to the full (John 10: 7 – 9). The valley is the gateway to the fullest Life we will ever know. Jesus the Savior, Shepherd, and Sovereign makes it so. This entry was posted in Encouragement, Keep a Quiet Heart and tagged peace, Psalm 22, Psalm 23, Psalm 24, shepherd, Trusting God, valley of the shadow on September 12, 2013 by Renee Ratcliffe. Have you ever had a chance encounter with someone from the past who takes you back to a long-ago place in your life? Sometimes it’s a good place with happy memories, but other times it’s a really uncomfortable place that you would rather be forever left in the past. I had that experience yesterday. Of course she didn’t mean it this way, and I don’t remember how aware she was of my situation 15 years ago. Maybe she remembered me as having some kind of illness. Whatever she remembered, she was right, whether she had said it explicitly or not – I used to look really bad. Sick. Painfully thin. Standing at death’s door. Honestly I don’t know why her comments drew out such awkwardness in me. I’ve spoken and written openly about my past struggle with anorexia. Truly I am beyond grateful and thrilled that God has brought me into freedom. Perhaps I look better on the outside, but more importantly, the Lord has healed me on the inside. Whatever my outward appearance may be, He has brought beauty from ashes just as He promised (Isaiah 61:3). I tried to be gracious to this lady, but I’ll admit being very, very relieved when she walked away. Why? I wondered. Why didn’t I just say something that would speak of God’s healing work in my life? I thought about this all day long, and I mentioned it to my husband. “She was just trying to encourage you,” he said. And he was right. I was letting myself focus on the negativity – I was hearing the horrible voice of condemnation. You used to look so bad. You messed up. You wasted years. “By this we know love, that He laid down His life for us” (1 John 3:16). “God is love. In this the love of God was made manifest among us, that God sent His Son into the world, so that we might live through Him” (1 John 4:8). “There is no fear in love, but perfect love casts out fear” (1 John 4:18). “In all circumstances take up the shield of faith, with which you can extinguish all the flaming darts of the evil one” (Ephesians 6:16). I am redeemed, I’m redeemed. * God loves me. Nothing will ever, ever separate me from His love. He gave His Son that I can be free. There is no need to fear or shrink back or be bound by shame. I am a conqueror through Christ Jesus. (Romans 8:1, 31 – 39). * My hope is in my redemption through Christ. He wipes away my stains and removes my chains. I belong eternally to Him (Titus 2:13 – 14). This is my story; this is my song. Let the redeemed of the Lord say so! “…. thank the Lord for His steadfast love, for His wondrous works to the children of man! For He satisfies the longing soul, and the hungry soul He fills with good things!” (Psalm 107: 8 – 9). This entry was posted in Encouragement, Fighting for Joy, Keep a Quiet Heart and tagged anorexia, despair, eating disorder, healing, past, Psalm 107, redeemed, Romans 8 on April 22, 2013 by Renee Ratcliffe.